Berkery, Noyes & Co. represents Fawcette Technical Publications, Inc. in its sale to 1105 Media, Inc. - Berkery, Noyes & Co., LLC. Berkery, Noyes & Co. represents Fawcette Technical Publications, Inc. in its sale to 1105 Media, Inc.
New York, January 2, 2007 — Berkery, Noyes & Co., LLC, the leading independent investment bank serving the media, information and technology markets, announces that it represented California-based Fawcette Technical Publications, Inc., a publisher of print and online resources and producer of conference and event activities, in its sale of assets to 1105 Media, Inc. Terms of the transaction were not disclosed. Fawcette Technical Publications, Inc. (FTP) is a leading multi-media provider of how-to, hands-on technical information for the IT development professional. FTP successfully integrates multiple information delivery formats—including print magazines, live conferences, and online technical web sites—for its professional audiences. FTP will be merged into 1105 Media’s Redmond Media Group. The transaction will enable 1105’s Redmond Media Group to cement its position as the dominant media outlet serving all facets of the Microsoft IT, Channel Partner and Developer Communities. Berkery, Noyes & Co., LLC acted as financial advisor to Fawcette Technical Publications, Inc., and represented it in its negotiations with 1105 Media, Inc. Berkery Noyes has been involved with many of the most notable transactions in the business-to-business media and information, Information Technology, scientific-technical-medical and academic publishing sectors, including those involving Hanley-Wood, Reed Elsevier, McGraw Hill, Wolters Kluwer, Thomson and many others. 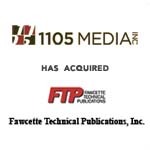 About Fawcette Technical Publications, Inc. – FTP is the leading multi-media provider of how-to, hands-on technical information for the IT development professional. As the only truly integrated media provider of its kind, FTP is the producer of print magazines (Visual Studio Magazine), conferences (VSLive!, Enterprise Architect Summit, and JavaPro Live! ); and the online network of technical sites at www.ftponline.com. About 1105 Media, Inc. – 1105 Media, Inc., is a leading provider of integrated information and media in targeted business-to-business markets, including specialized sectors of the information technology community; industrial health, safety and compliance; security; environmental protection; and home healthcare. 1105’s offerings span print and online magazines, journals and newsletters; seminars, conferences and trade shows; training courseware; and web-based services. 1105 Media is based in Chatsworth, CA, with offices throughout the United States. It was formed on April 7, 2006, by Nautic Partners LLC, Alta Communications and Neal Vitale, to acquire 101communications, LLC, and Stevens Publishing. Based in New York City, Berkery, Noyes & Co., LLC provides strategic mergers and acquisitions transaction advisory services, financial consulting and strategic research to middle market media, information and technology companies in the United States and internationally.